Mattis is a Norwegian trick-taking game for three to eight players. A game of Mattis consists of two distinct parts. First, players build their hands by capturing cards during the first trick-taking segment. Then, players try to rid their hand of cards in the second half. The last player to have cards in their hand is called the mattis, Norwegian for fool. Mattis is part of a family of Scandinavian games with this two-part structure. Like the Swedish game Skitgubbe and the Finnish game Koira, it likely derives from the game Myllymatti, which originated in what is now western Finland in the early nineteenth century. As these games spread west into Norway, they evolved into what is now called Mattis. The object of Mattis is to capture high-ranking cards through the first round of trick-taking. Then, the players take part in a second round of trick-taking, using the cards they won in the first round. The ultimate goal of the game is to avoid being the last player holding cards in the second round. In order to play Mattis, you’ll need a standard 52-card deck of playing cards. 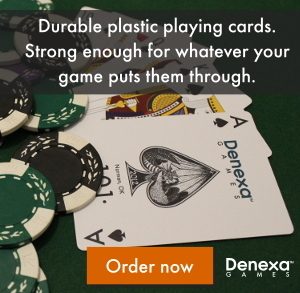 Of course, you’ll probably want to treat your guests to your Denexa 100% Plastic Playing Cards. Shuffle and deal three cards to each player. Place the remaining cards in the center of the table, where everyone can easily reach it, forming the stock. The player to the dealer’s left leads any card they wish to the first trick. Each player in turn then plays whatever card they wish. There is no requirement to follow suit. Whichever player contributes the highest card (according to the standard ranking, with aces high, and irrespective of suit) to the trick wins it. They collect the cards played to the trick, placing them face-down in a won-cards pile in front of them. Each player then draws back up to three cards, and the player that won the trick leads to the next one. In the event that two or more cards tie for highest, all of the cards in the trick remain on the table. Each player involved in the tie then plays another card to break the tie. If there is another tie, the tied players play again, and so on until the tie is resolved. The ultimate winner takes all of the cards on the table (both the original trick and all the tiebreak cards) into their won-trick pile. When there are cards left in the stock, a player can choose to play blind by turning up the top card of the stock. When they do this, they are committed to play whatever card comes up; they cannot change their mind and play a card from their hand. When the last card of the stock is drawn, the player who draws it shows it to the other players. Then, they put it directly into their won-cards pile. The suit of this card will become the trump suit in the game’s second phase. With the stock now depleted, play continues on, but players simply do not draw new cards. 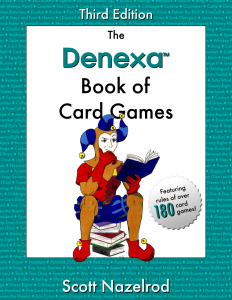 The first phase ends when a player runs completely out of cards. Each player puts any remaining cards in their hand into their won-cards piles. Any player that did not capture any cards during the first phase are called blåmattis (blue fool), but they remain in the game for the second phase. Each player’s won-tricks pile forms their hand for the second half of the game. Players who are blåmattis will, of course, start the hand with no cards. Game play begins with the player who took the last card of the stock (the trump maker) in the first phase. This player leads any card they wish to the first trick. Each player in turn then plays a card that beats all previous cards played to the trick. A card is considered higher than another card if it is of a higher rank and of the same suit, or if it is a trump. Rather than playing a single card, a player may also play a sequence. A sequence is two or more consecutive cards of the same suit. This helps a player get cards out of their hand more quickly. The length of a sequence doesn’t matter, only the rank of the cards comprising it. A sequence can start a trick, or it can be played to beat a lower single card or sequence. Higher single cards can beat lower sequences. If a player is unable to play (either because they are blåmattis or because they have no cards that can beat the last card played), they pick up the lowest card on the table, and the trick continues with the next player to the left. When the lowest card on the table is part of a sequence, someone who cannot play to a trick must pick up that entire sequence. A trick is considered complete whenever there are the same number of plays (either single cards or sequences) in it as there were players at the start of the trick. For example, if a trick started with four players, there would need to be four plays in it before the trick was considered finished. When a trick is finished, the cards in it are discarded, and the last person to play (and thus who played highest) leads to the next trick. As players run out of cards, they drop out of the game. The last player with cards loses and becomes the mattis. Traditionally, during the next game, the mattis of the previous game is required to wear the mattishaetta (fool hat), a particularly ugly hat procured for the purpose.